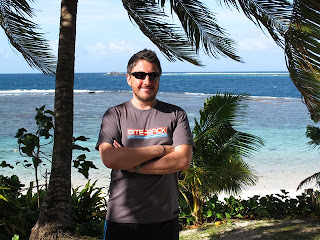 Steven Malone tells all about his adventure to Fiji after being the lucky winner of the raffle at the Bite-Back at Cancer Ball last year. So successful was the event, that it's going ahead again for a sixth year! Have a read of Steven's adventures and we'll tell you where you can get hold of your tickets a little later. "Taking off from Heathrow, we waved goodbye to the grey skies and rain. Landing in Fiji twenty three hours later, we were a little unnerved to find we'd brought the grey skies along with us! In true tropical style though, the sea breeze soon saw off the clouds and we were treated to the beginning of two weeks of sunshine. After a night of sampling the local brew (Fiji Gold, highly recommended!) at Raffles, we jumped a taxi and headed to Port Denerau (think Port Ghalib for those of you who know Egypt) and boarded the MV Reef Explorer for our mini cruise. We spent the next three days sailing round the Yasawa islands; all picture postcard tropical paradises. In between the food and drinks, I managed to squeeze in a dive with the onboard divemaster. My UK experience came in handy as the sea had picked up and was a bit choppy by Fijian standards!! Lots of lounging on sunny beaches followed and by the end of the three days our jet lag had disappeared and we were ready for the next leg of our trip. Heading back to Nadi airport, we boarded our flight to the island of Kadavu. Our plane was a tiny workhorse twin prop model built back in '67. A classic! We were the only two people on the flight, so the safety briefing mostly involved the pilot turning round and giving us a confident thumbs up!! The low flight, open cockpit and big windows gave us a great view as we flew over the inviting reefs below and as we landed on the small runway at Kadavu, we knew we were VERY far from home! Making our way through the "terminal" (a small wooden building, we were met by Thomas from the Matava Eco Adventure Resort. A short bumpy truck ride later, we were being whisked out to sea and around the coast on a small open longboat. Forty minutes later, we knew were were now very definitely far from home!!! Arriving at Matava is an amazing experience. As the boat draws in to the small jetty, the traditional Fijian thatched huts (or "bures") nestled in the lush tropical forest come into view. We were welcomed in the main bure and immediately served an amazing homecooked lunch with fresh salad from the Matava organic garden and water fresh from the spring (double filtered for purity and better than anything out of a bottle!). After lunch, we made our way up the hill to our own bure. The view was incredible and with solar heated water and lighting but no other power, our mobile phones were definitely off for the week, ensuring some much needed peace and quiet! 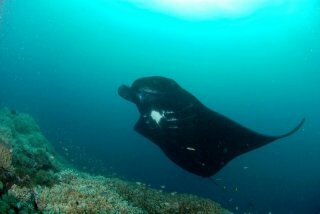 We spent the next seven days diving the beautiful Astrolabe reef with Te and Wise, the Matava divemasters. Plenty of healthy hard and soft coral, yellowfin tuna, Spanish mackerel and plenty of reef sharks all kept the dives interesting. In between jumping into the warm blue water, we were treated to organic home grown cooking. Fresh fruit grown at Matava for breakfast and lots of fresh fish (no shark obviously!). 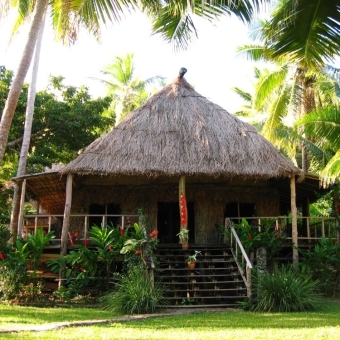 Kadavu is not a densely populated island and is a great way to see some of the "real" Fiji. While the main islands are quite westernised, the outlying areas like Kadavu have remained a lot more rural. This makes for a great atmosphere, with the famously friendly Fijians treating us to a traditional Lovu feast (think buried barbecue pit) and several rounds of Kava, the traditional tribal drink. As always, the week flew by far too quickly and before long we were back on the small longboat heading back to the airport for another ride on the little plane. After another thumbs up safety check from the captain, we were winging our way back to Nadi airport. 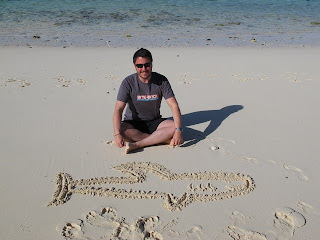 The last leg of our trip was at the luxury small island resort of Matamanoa, a true Tom Hanks/Castaway/tropical paradise. We'd decided to upgrade our travel plans to make the journey to Matamanoa more interesting, so after leaving the small plane from Kadavu, we headed over to the Island Hoppers office and picked up a helicopter transfer to Matamanoa! If you've never flown by helicopter, go and book a flight in a helicopter! Incredible!! Swooping low over the sea, we headed past tiny islands and submerged reefs before landing on the Matamanoa helipad. An amazing experience! After a week of diving, Matamanoa was the perfect was to end the trip. White sandy beaches, palm trees, food, cocktails, sun, sea….. VERY relaxing!! As with all the best holidays, time flew. As the 747 rumbled down the runway in the direction of home, I wondered if anyone would mind if I bought a few more raffle tickets from Bite Back next year……"
With thanks to Tourism Fiji, who have been a phenomenal help in making 2011 the most successful event ever. Total funds raised will just over £19,500 which is £8,000 more than the 2010 event! Want to be part of this success? The next Bite-Back at Cancer Ball will be held in London on 20 October 2012. Contact a member of the Dive Worldwide Team or visit our website for some inspiration on a wonderful destination.